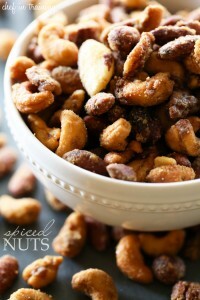 Spiced Nuts make for GREAT holiday gifts! If you are looking for a quick last minute gift idea, this would be a great one to try. These nuts are like a roller coaster of flavors. When I made them it was an up and down of sweet, spicy and savory. They keep me on my toes and I thoroughly enjoy them! They are a great snack and munchie to have around the house. If you love nuts and lots of flavor, then you will LOVE these bad boys! These nuts are spicy, savory and sweet all in one! They are super easy to a make and packed with a variety of flavors! Line a cookie sheet with foil and then place a wire cooling rack over the top. Set aside. Heat oil in a large pan to 365 degrees F. DO NOT fill the pot of oil more than ⅔ of the way full. Fill another large pot ½ of the way full of water and bring to a boil. In a medium bowl, combine powdered sugar, curry, cinnamon, mustard, allspice, ginger, and cayenne and whisk until well combined. Take one cup of the nuts and blanch them in the water for about 30 seconds. Remove nuts with a fine mesh sieve and place in a separate medium bowl and immediately add ¾ cup of the sugar/spice mixture. Coat the nuts well. The sugar should form a thick paste, add more if necessary until it is well coated with a paste. Immediately fry nuts for 30 seconds to 1 minute, then transfer using the fine mesh sieve to the baking sheet lined with foil and topped with a wire cooling rack placed over the top. Spread nuts out and sprinkle with salt to taste. Skim any residual sugar from the surface of the oil before frying the next batch to prevent burning. Repeat the process for a cup of nuts at a time until all 6 cups are done. Snacks like these are my downfall! Cannot even make them :) They look way too good! Pinned!